Useful reloading gear does not have to be costly. 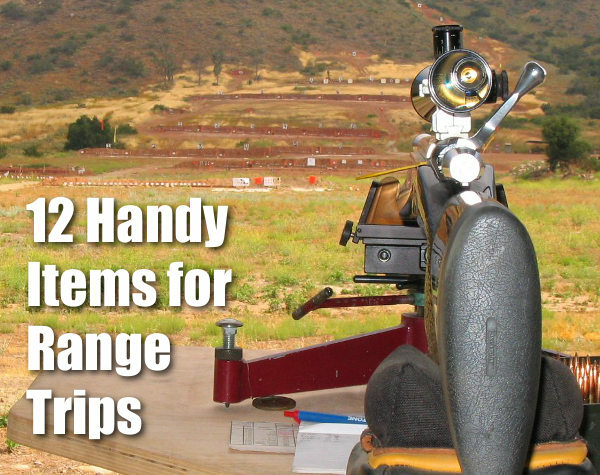 Here are ten handy (and very inexpensive) items that belong on your loading bench or in your range kit. 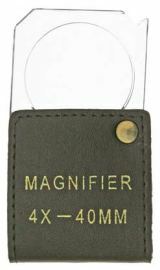 • Magnifying Glass – We use a flat, 2″x2″ pocket 4x-8x magnifier. This folds up on itself. 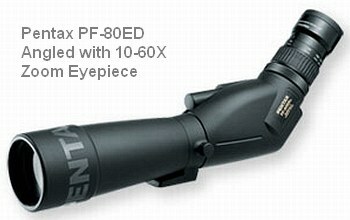 Very handy, we use it to inspect bullets and brass. 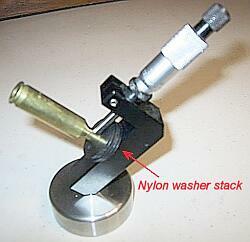 Use this to check your flash holes for burrs, and check the meplats of your bullets before loading. 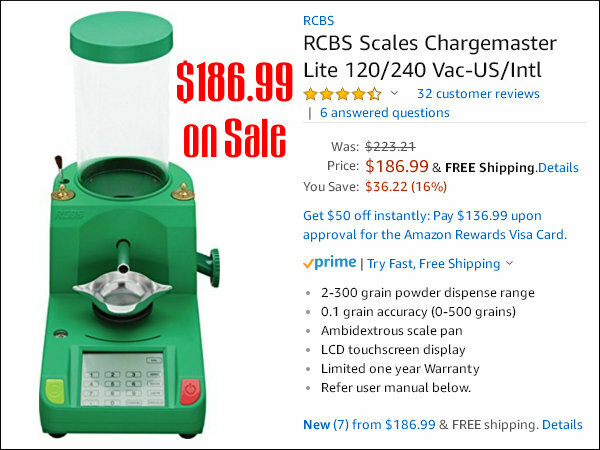 • Clear 35mm Film Cannister – Use this to transfer the thrown powder charge to the little measuring cup that sits on your scale. That way you don’t get any kernel splash. Also if the charge weight is obviously off, it’s easy to dump back in the measure. A film canister works pretty well as a trickler too. • Compressed Air in a Can -- Get these at office supply stores. Use the can (with tube attached) to blow crud out of cases after cleaning the neck with a brush, and blast loose debris out of primer pockets. • Pin Vise – A simple pin vise with a #53 bit is perfect for deburring Lapua PPC and BR flash holes without reaming the flash-holes any larger. The Lapua PPC/BR flash-hole diameter is 1.5 mm, or 0.059″. 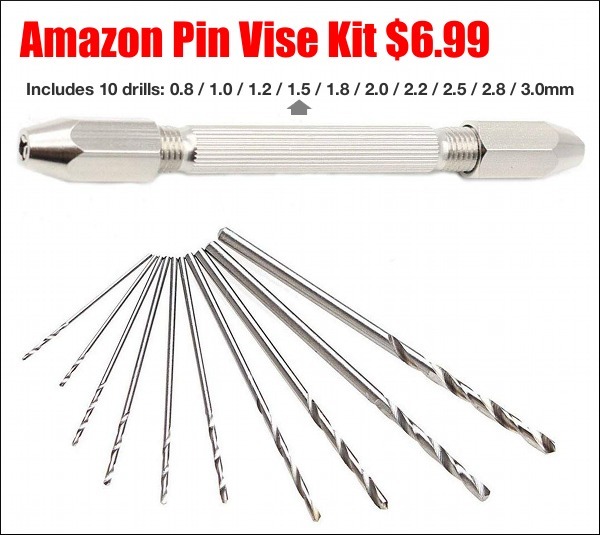 Amazon.com sells a handy $8.28 pin vise kit with 10 bits, including the ideal 1.5mm bit. Other vendors offer a #53 pin vise bit that measures .0595″ or .060″ (depending or source). You can find pin vises and bits at hobby stores. Note — The model shown below is currently out of stock, but there are many pin vise sets offered from $7 to $15. • Bounce Dryer Sheets – The common dryer sheets eliminate “static cling” on your plastic reloading parts such as powder measure cylinders, powder funnels, and reloading press plastic bins. Thanks to Doc76251 for this tip. 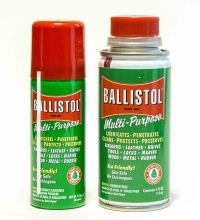 • Ballistol Aerosol – Try using this versatile lubricant/solvent for full-length sizing. Spray some on a patch and you can wipe the carbon of your case necks. Then, continue to apply a very small amount of Ballistol on the case bodies — just thin sheen is all you need. Ballistol is super slippery, and easy to remove. For general full-length sizing (on small cases) it works great and doesn’t leave a gooey, waxy, or chalky residue. For heavier case-forming jobs, we recommend Imperial Die Wax. • Shotgun Mop – Stick this in the chamber when using Wipe-Out foaming bore cleaner. This will seal off the chamber so the foam doesn’t flow into your action. For long chambers screw on one section of cleaning rod to aid extraction. 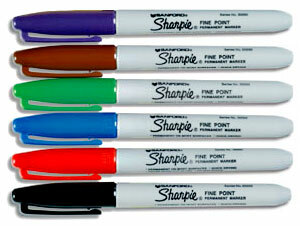 • Colored Sharpie Marking Pens – Mark your bullets ahead of the bearing surface, and the color transfers to the target. 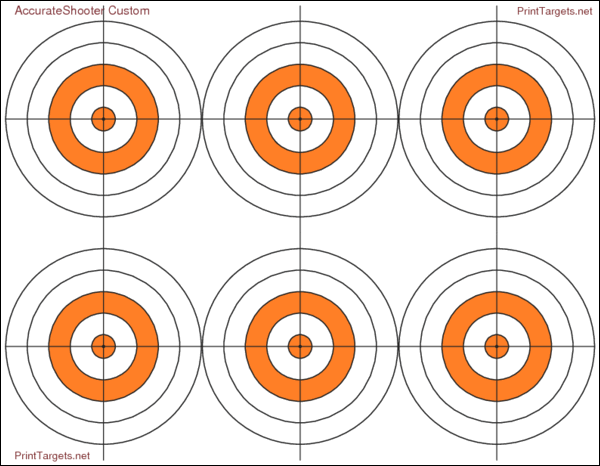 This way you can shoot multiple loads at the same point of aim and discern which load shoots the tightest. 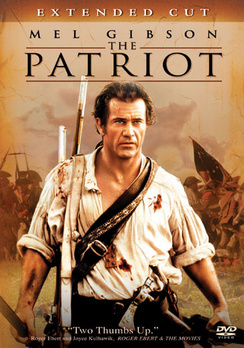 (Recommended for 300 yards and beyond). With colored bullet tips you can test multiple loads “round robin” to equalize wind effects. 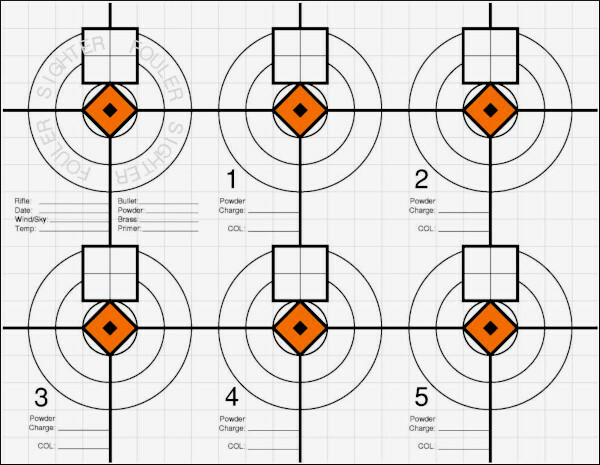 When testing seating depths for example, you can mark the longer-seated set of bullets red and the shorter-seated set green and shoot them during the same sequence. 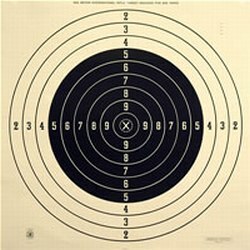 Just look at the colored marks on the target to see which grouped better. • Thin Latex Gloves – You should keep a box of inexpensive, disposable latex gloves (the kind doctors use) in your loading room. These will prevent contamination of primers or powder kernels that you handle directly. Also, use the gloves when handling fine blued tools or firearms to prevent transfering body oils and salts that promote rust. • Plastic Washers for Neck Mic – If you use a Sinclair Neck-wall Micrometer Gauge with integral stand, you can use thin plastic washers to adjust the height of the case on the mandrel. This makes it much easier to measure the same point on the case neck every time. Thanks to MikeCR for this tip (and photo). Share the post "Cheap Tricks — Ten Handy Budget Items For Hand-Loaders"
At long range, small bullet holes are much easier to see “in the white” than in the black center of the normal High Power target. 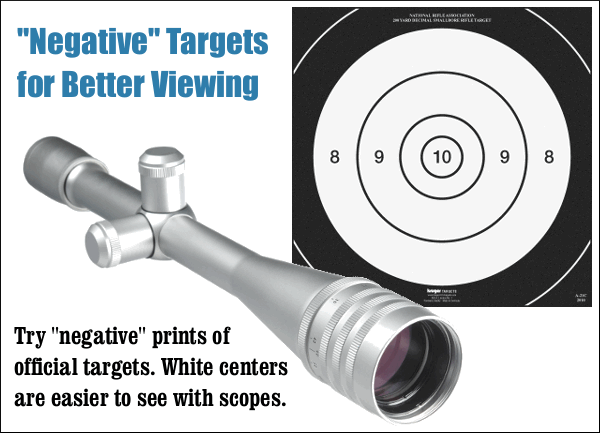 When you’re practicing at long range using a scoped rifle, one way to enhance your ability to see your bullet holes is to print a “negative” version of the regulation bullseye target so that your black center is now white. How do you create a “negative” of a target image? Many image programs, including the FREE Irfanview software, have a “Negative” function in the pull-down menu. If you don’t see a “Negative” menu option in your program, look for a “substitute colors” option. Many printers also have a “reverse colors” function. 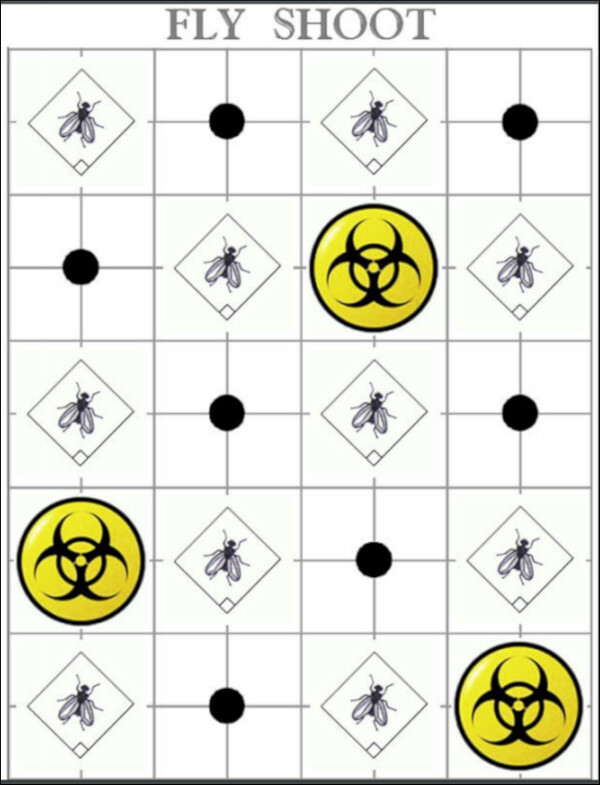 If you can’t find a solution with your computer or printer, just take a normal bullseye target to a copy shop, and the staff can easily print you a set of targets with white centers in black fields. If you’re not concerned with official scoring rings, you can use an all-white target with a bright, fluorescent target dot in the middle. A 2″- or 3″-diameter stick-on target dot is highly visible at 600 yards. Birchwood Casey Target Spots® assortment #33928-TSA offers neon orange target dots in 1″, 2″, and 3″ diameters. For practice backers for the Day-GLo pasters at long distance, use Flip Chart Paper (aka Easel Pads) marked with graph lines at 1″ intervals. 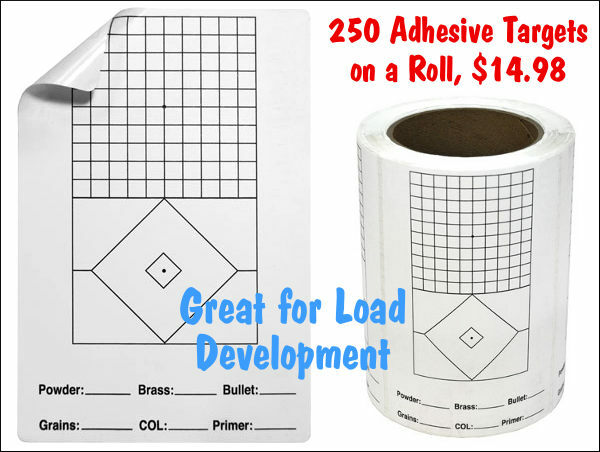 Available either regular or self-stick, one sheet can hold 4-8 pasters and the white paper allows for easy spotting of the holes and quick estimation of group size. 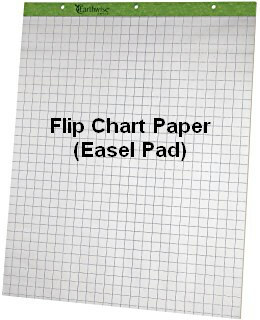 Get Flip Chart Paper at Amazon.com, Staples, or Office Depot. In the UK, some ranges are now using a “reverse-style” target with a mostly white area. Laurie Holland says this allows shooters to see shots much more easily. 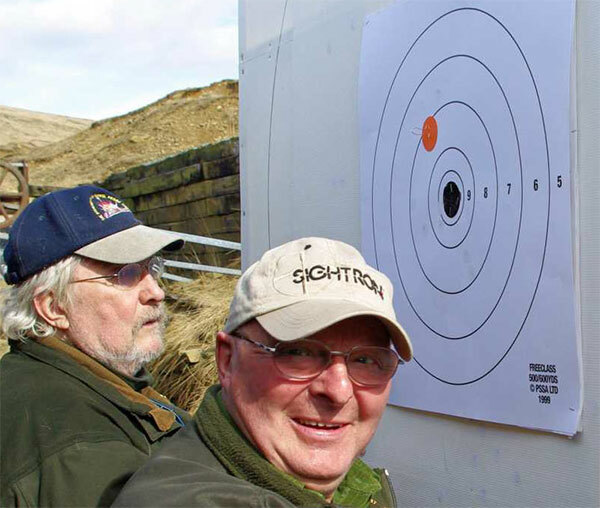 Laurie reports: “Here’s a photo of the 500/600 yard F-Class match target we use in PSSA comps at Diggle Ranges with club members Chris Hull (L) and Terry Mann (R). 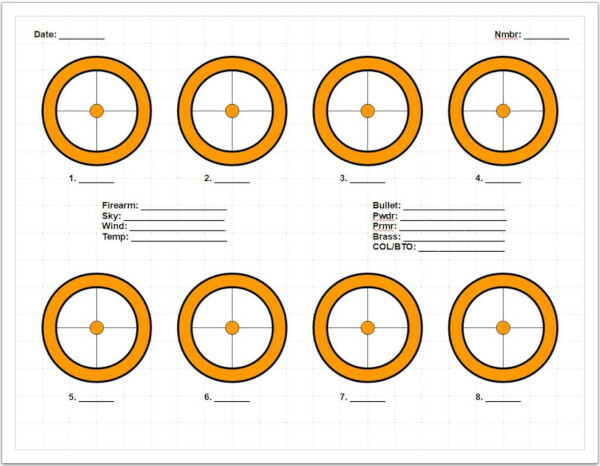 We now use this target form at all ranges up to 1K for F-Class, and, yes you can often see your hits at 600 yards on the target before the markers pull it. Regards from England — Laurie”. 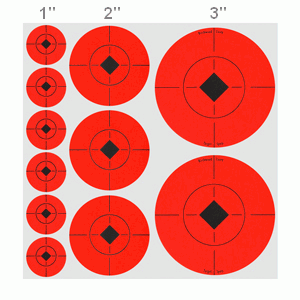 Share the post "Flip Your Target Colors for Better Long-Range Viewing"
Today is Thanksgiving. What better way to celebrate the occasion than to blast away at some bearded gobblers (of the paper variety). 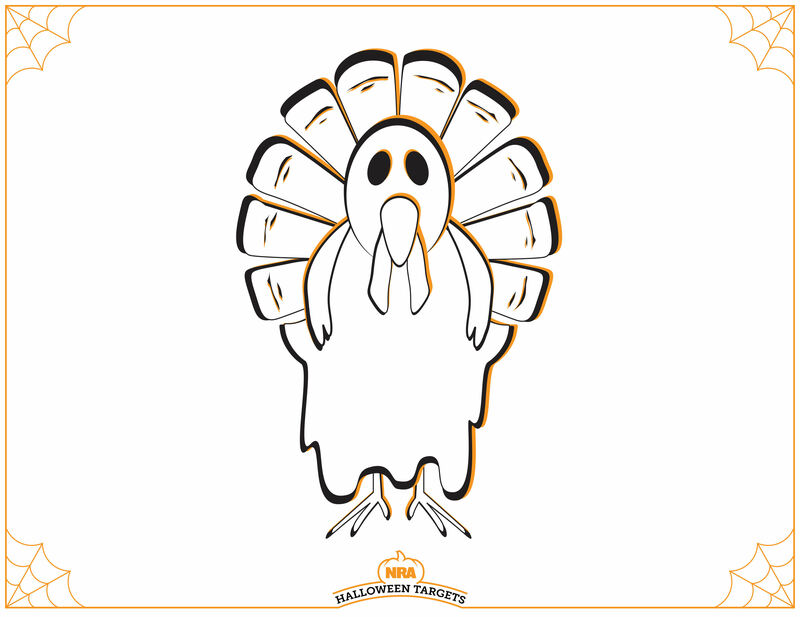 Here’s our custom Turkey Day target, ready for family fun. 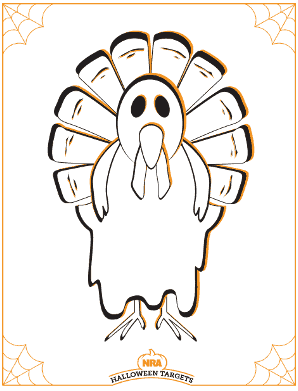 This special Turkey Bullseye Target was created by our friend and Forum member Pascal (aka “DesertFrog”). 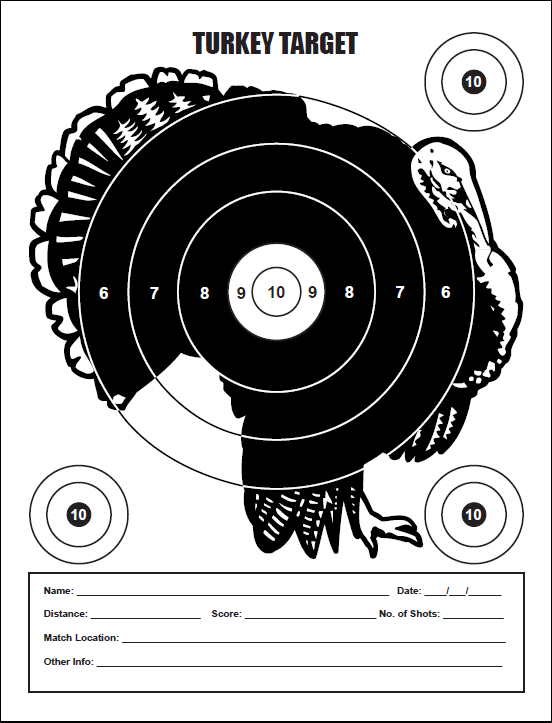 CLICK HERE for FREE Turkey Target. 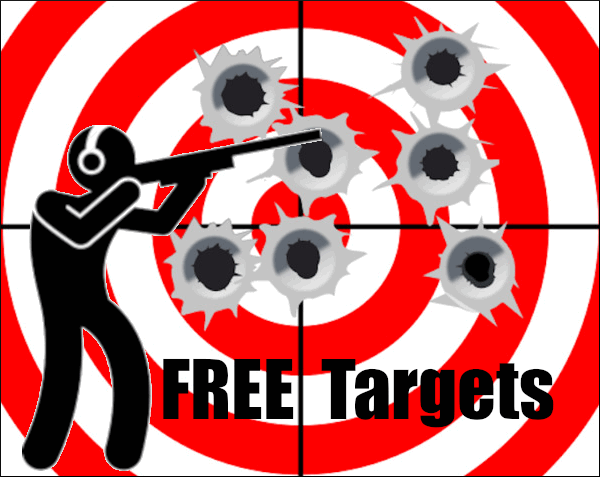 Share the post "Have a Blast This Thanksgiving with FREE Turkey Target"
Just click an image to launch its full-size version. 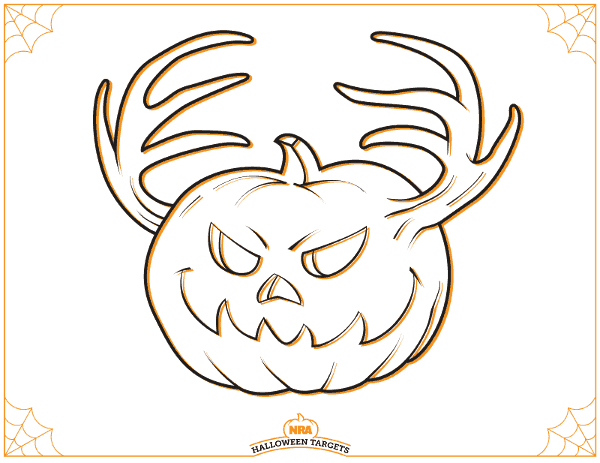 You can then download the target and print it out on regular 8.5″x11″ paper. Now you have fun Halloween-themed targets to bring to the range this month. 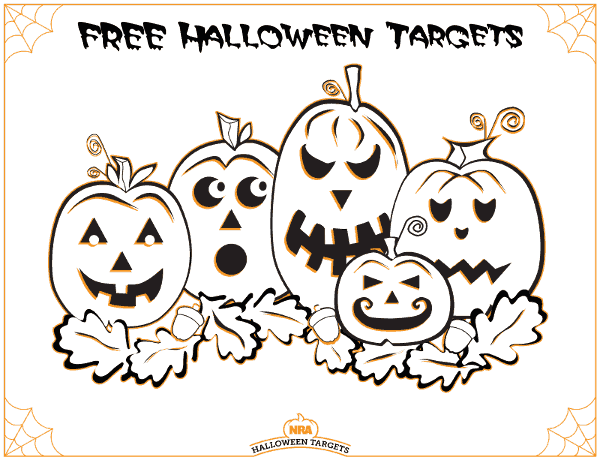 Share the post "Have Fun with Free Halloween-Theme Targets"
We love shooting steel. It’s fun to hit a gong, see the swing of the steel, and hear the re-assuring “clang”. But when shooting at shorter ranges, say 100-200 yards, the typical 6″ to 8″-diameter steel gong doesn’t present much of a challenge to a good marksman with an accurate rifle. Now that’s all changed. 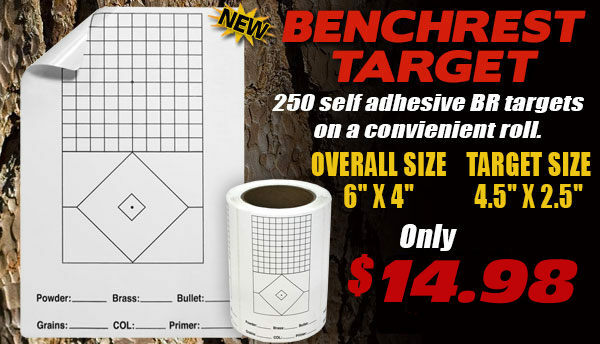 ShootingTargets7.com offers a series of smaller “Precision Gongs” that will provide all the challenge you could want, even at close range. There are round Micro-gongs in 2″ and 3″ diameters, plus 1″ (W) x 4″ (H) “finger plates”. Choose AR500 or AR400 steel (AR500 is stronger). Great News — these Laser-Cut Precision Gongs are now 50% OFF with code PG. Get a 2″ AR500 Gong (3/8″ thick) for just $6.47. 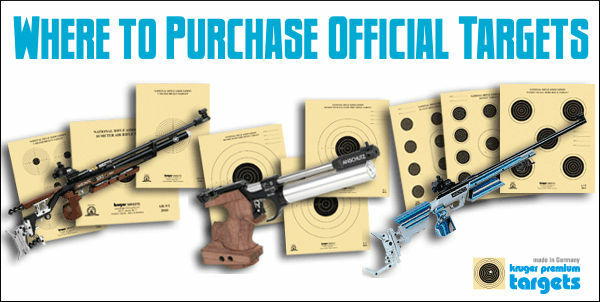 Or purchase a 3″ AR500 Gong (1/4″ thick) for just $5.47. Prices vary with metal thickness, going up to 5/8″ max thickness. The biggest, thickest, 3″ AR500 Micro-Gong costs $11.97. Save more with bulk orders — you get FREE Shipping on all orders over $99.00. These Precision Gongs work best suspended with rubber target-hanging straps, also available from ShootingTargets7.com, starting at $6.20 per pair for 8″-long straps. Share the post "Got Gong? Precision Micro-Gongs 50% Off"
Assembly Diagram: Here are all the components of the target frame. The overall maximum assembled dimensions are roughly 26″ wide, 41″ deep, and 66″ tall (the cardboard is 2 x 3 feet). Of course you can modify the dimensions as desired. 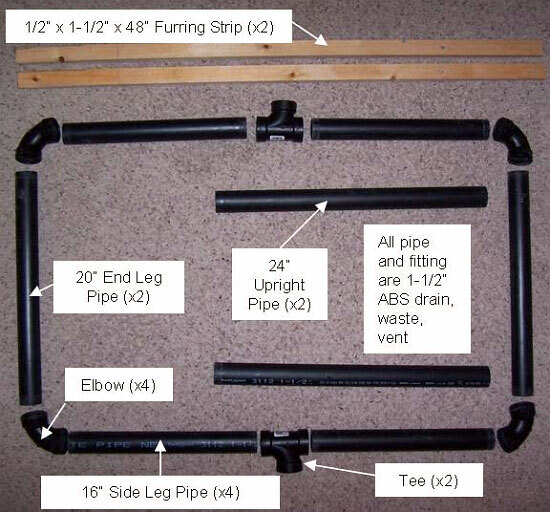 I chose the black ABS pipe over white PVC simply for cost — black ABS is a little cheaper. You can also glue some or all of the parts together, it’ll just be larger for transporting. In windy conditions, the thing likes to come apart. Duct tape might work well. 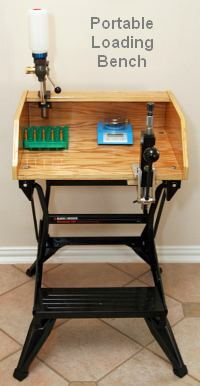 Share the post "Build Your Own Target Stand with Inexpensive PVC or ABS Pipe"
A while back, we featured a portable reloading bench built on a Black & Decker Workmate. That proved a VERY popular do-it-yourself project so we’re showing it again, in case you missed it the first time. 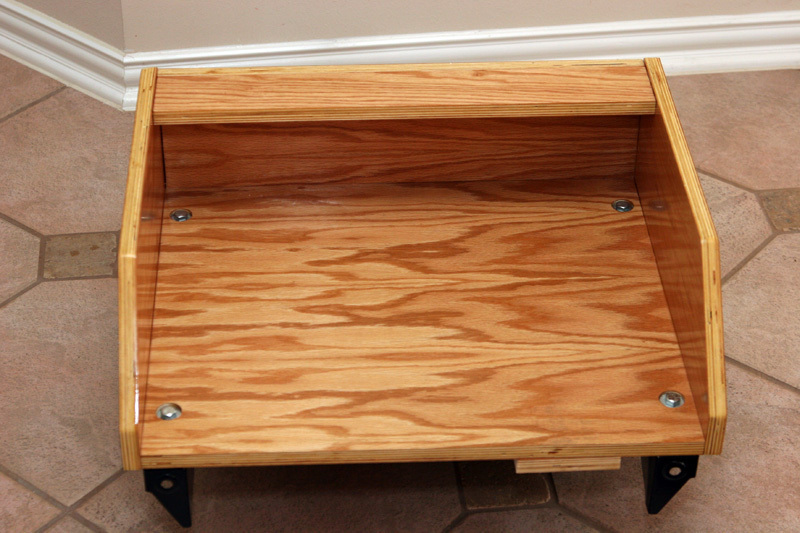 Texan Robert Lewis made himself a great portable reloading bench from plywood mounted to a Black & Decker Workmate. 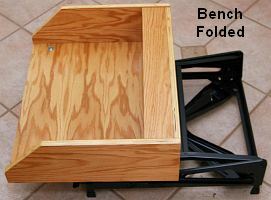 The bench, roughly 22″ x 19″ on top, folds up to fit easily in your car’s trunk or behind the seats in a pick-up truck cab. Four recessed bolts hold the wood top section to the collapsible B&D Workmate.The sides and back of the unit are attached to the base with small nails. There is a small shelf (also nailed in place) which can be used to clamp a powder measure or hold a scale. Shown in the photo is a Harrell’s Benchrest measure and Harrell’s single-stage “C” press. Click for Detail of Top. Editor’s NOTE: In the time that’s transpired since we first ran this story, the price of a Black & Decker workmate has gone up. However you can still pick a WM225 Workmate for under $65.00. Target is currently selling WM225 Workmates for $64.99. 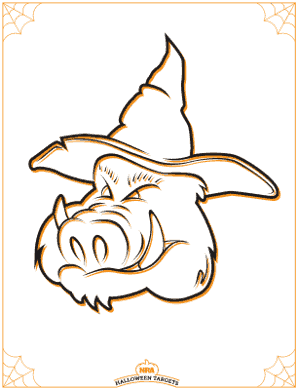 Click HERE for FREE WORKBENCH PLANS. 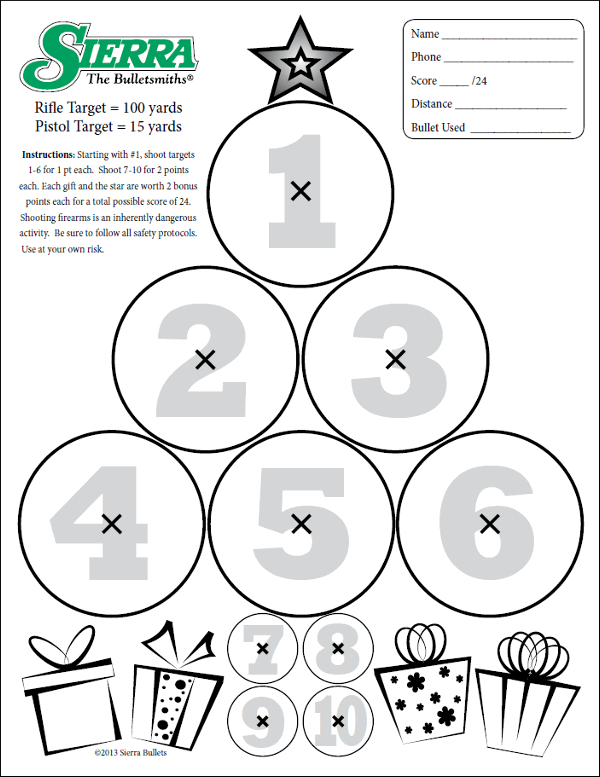 Share the post "Build Your Own Portable Reloading Bench with B&D WorkMate"
Share the post "FREE Christmas Tree Fun Target from Sierra Bullets"
We created this custom target in 5 minutes using PrintTargets.net. 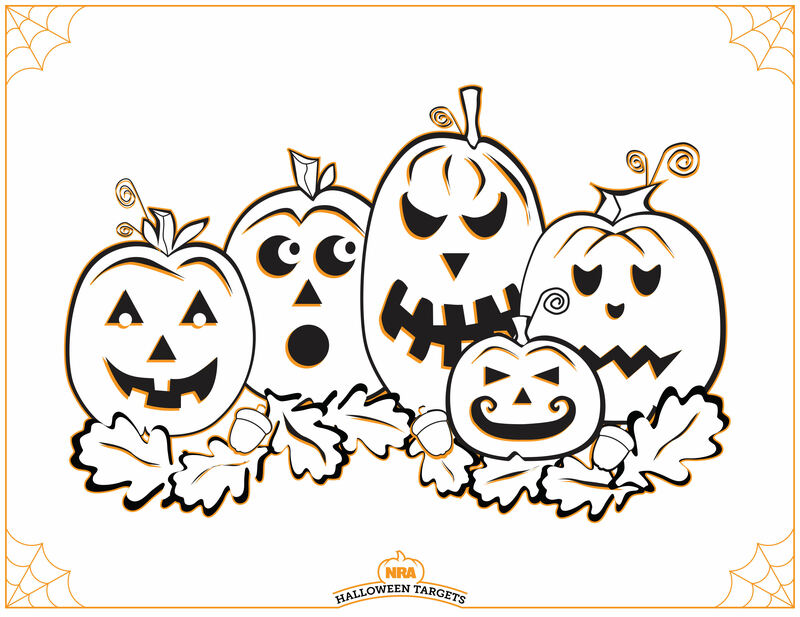 If you like it, DOWNLOAD HERE. Just follow the step-by-step instructions to set paper size, layout, bullseye color, line thickness, number of rings and diameter. You can even add Score Numbers to your target rings. PrintTargets.com is easy and fun to use. It’s much faster to create targets this way than to try to draw a series of circles with PowerPoint or MS Paint. 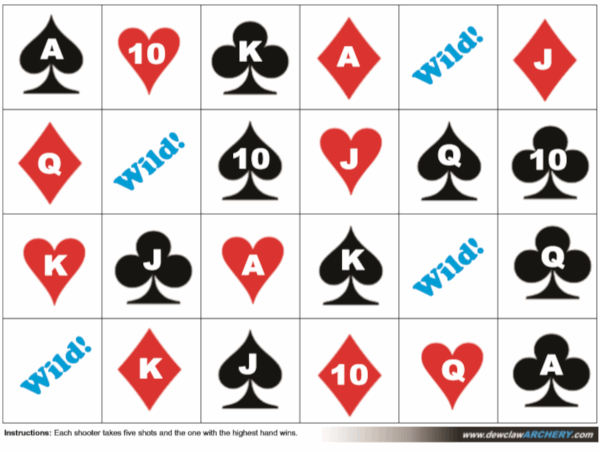 Power-User Tip: PrintTargets.com even offers a handy diamond-grid calibration diagram that you can add to your custom target designs. 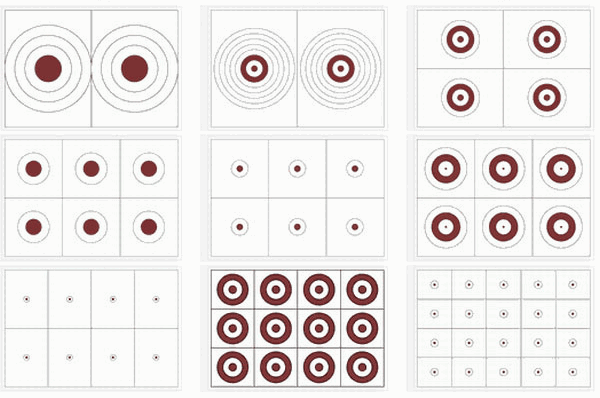 You’ll find the calibration grid as option #15 when you design your target — just scroll all the way down the PrintTargets.com home page. 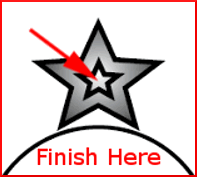 CLICK Graphic to Create Your Own Targets. 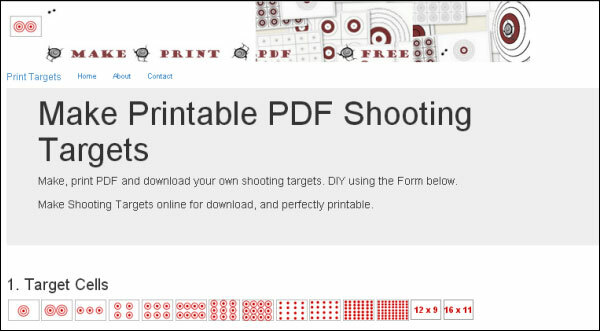 Share the post "Get Creative — Design Your Own Custom PDF Targets"
We all wish we could spend more time shooting and less time sitting in front of a computer. But when you can’t avoid “keyboard commando” duties, here’s a way you can keep your focus on the X-Ring. Creedmoor Sports offers Shooters’ Mouse Pads for $4.95. This popular (and very functional) product will improve your web-surfing experience (nobody likes an old dirty mouse pad). 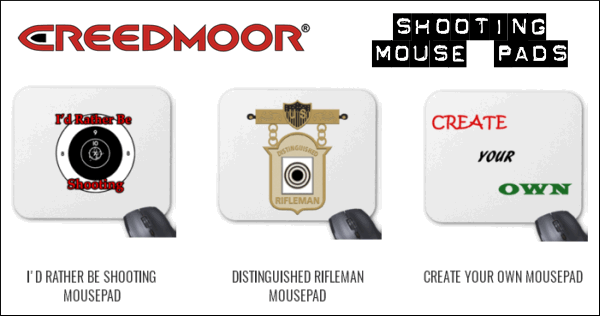 Digitally printed, Creedmoor’s mouse pads are offered in five basic designs: Bull Target, 6 Inches, Distinguished Rifleman, Distinguished Pistol, and “I’d Rather Be Shooting”. Or, for an extra charge, the pads can be printed with a custom design for your shooting club or rifle team. 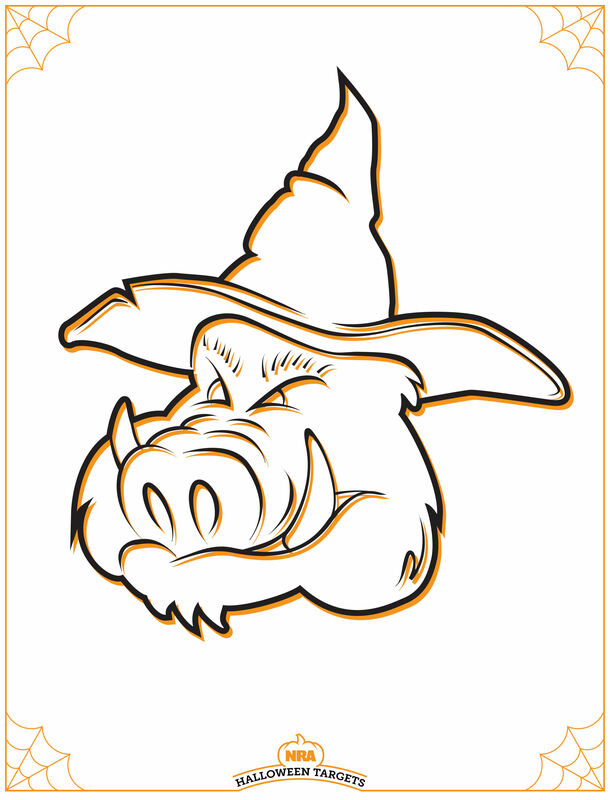 Mouse pads printed with either the basic designs or custom logos would make excellent prizes to be awarded at your local club. This is a great way to promote your club or organization. 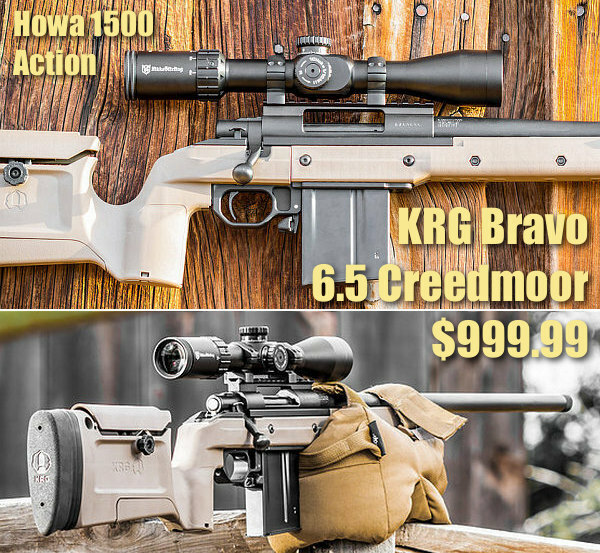 Call 1-800-CREEDMOOR for quantity discounts. 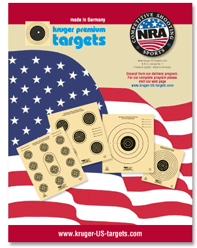 Share the post "Shooters’ Mouse Pads from Creedmoor Sports"
Kruger offers the full array of official NRA air rifle, air pistol, international pistol, and smallbore targets. 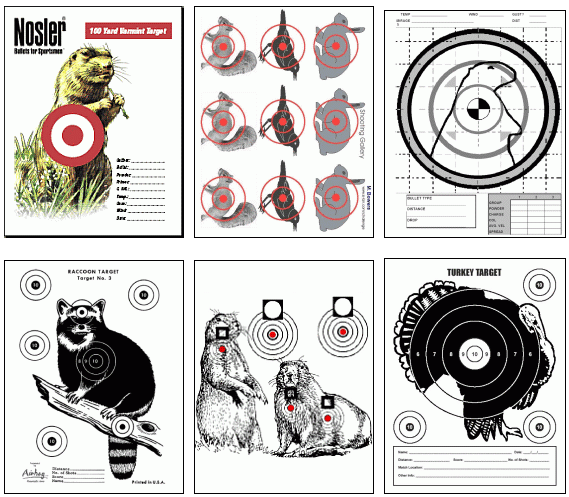 In addition, Kruger sells photo-realistic Animal Targets, plus a cool series of Fun Targets for plinking and informal practice. 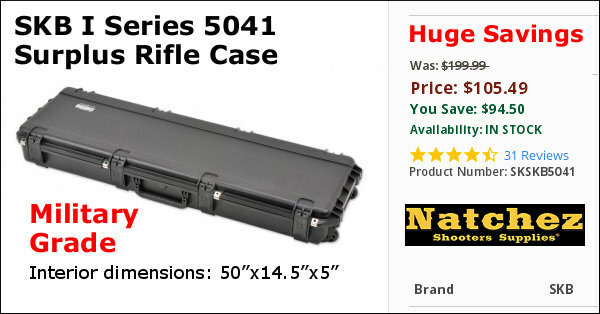 Kruger targets can be ordered online through www.Kruger-US-Targets.com or you can call Kruger’s USA distributor, MK Tactical, at (503) 746-6816. MK Tactical is located in Hillsborough, OR. 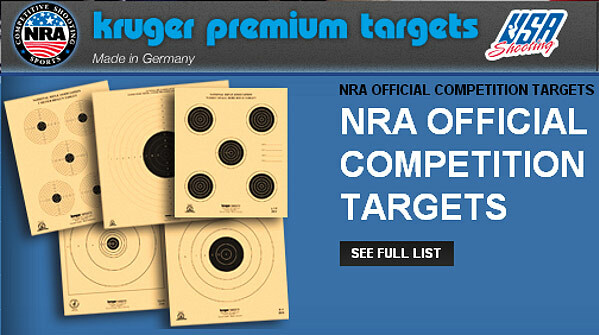 Share the post "Get Top-Quality Official NRA Targets from Kruger USA"
How does Dan’s XP-100 pistol shoot? Look at that target showing TEN shots at 100 yards, with eight (8) shots in the main cluster at the top. 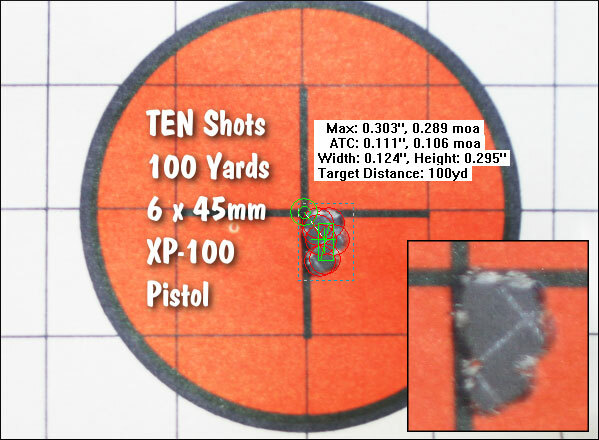 The ten-shot group measures .303″ (0.289 MOA), as calculated with OnTarget Software. Not bad for a handgun! What do you think, can your best-shooting rifle match the 10-shot accuracy of this XP-100 pistol? This pistol belongs to Dan Lutke, a Bay Area benchrest shooter who publishes the results for the Visalia matches to the competitors and the NBRSA. He has been an enthusiastic competitor for an number of years, at various ranges, notably Visalia and Sacramento. 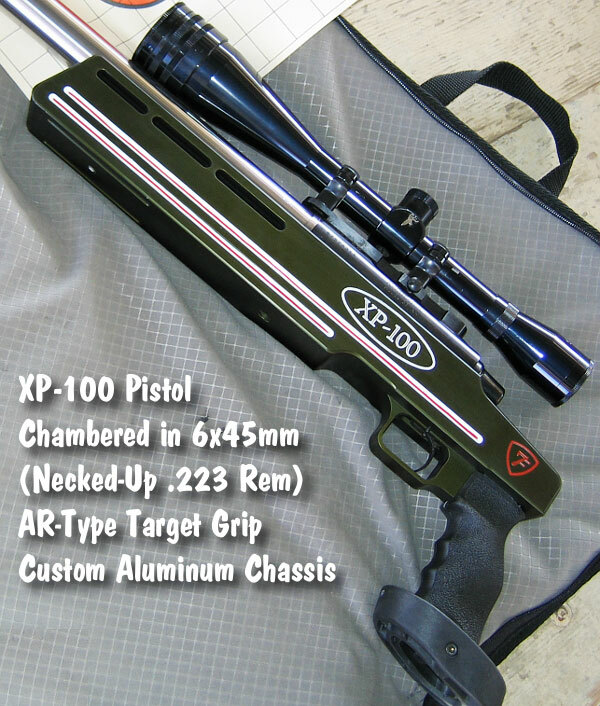 The action is a Remington XP-100, to which a Kelbly 2 oz. trigger has been fitted. On top is an old Japanese-made Tasco 36X scope (these were actually pretty darn good). 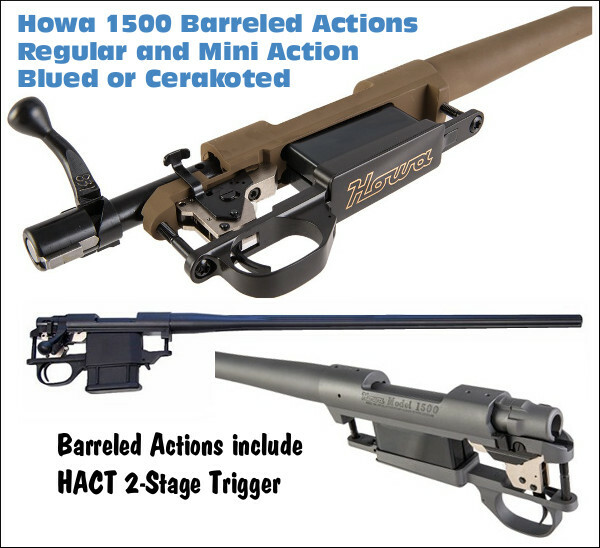 The Hart barrel (a cast-off from Dan’s Unlimited rail gun) was shortened and re-chambered for the 6x45mm, a wildcat made by necking-up the .223 Remington parent case. The custom stock/chassis was CNC-machined by Joe Updike from 6061 Billet Aluminum to fit the XP-100 action and mount a target-style AR grip with bottom hand rest. The gun was bedded and assembled by Mel Iwatsubu. In his XP-100 pistol, Dan shoots 65gr custom boat-tails with Benchmark powder. 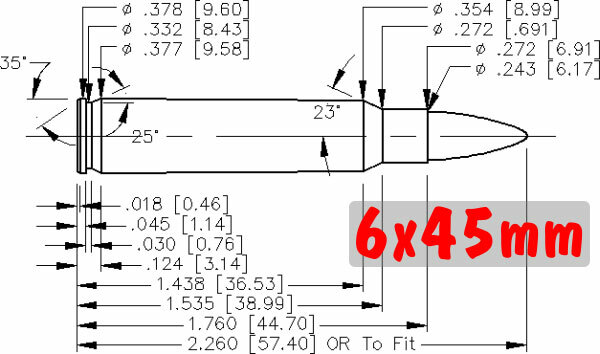 This diagram shows the most common 6x45mm wildcat, which is a necked-up version of the .223 Remington parent cartridge. 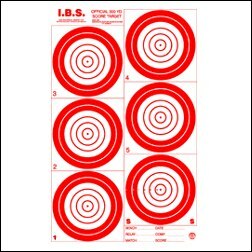 NOTE: The dimensions for Dan Lutke’s benchrest version of this cartridge may be slightly different. ACAD drawing by Peter Gnanapragasam CC by SA 3.0, via Wikimedia Commons. Title Added. 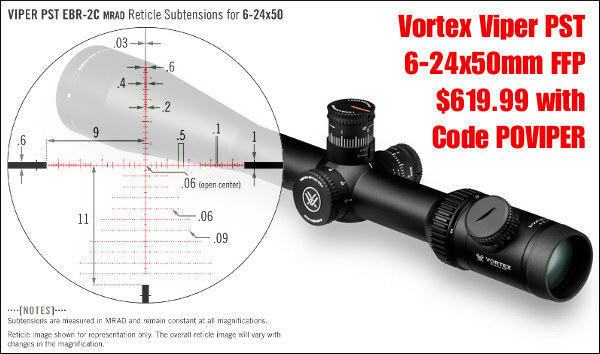 Share the post "Amazing Benchrest Pistol — Ten Shots in 0.289 MOA"
Here’s a clever item for the avid shooters on your Xmas gift list. For the holiday season, Creedmoor Sports has created special package-wrapping paper with target graphics. 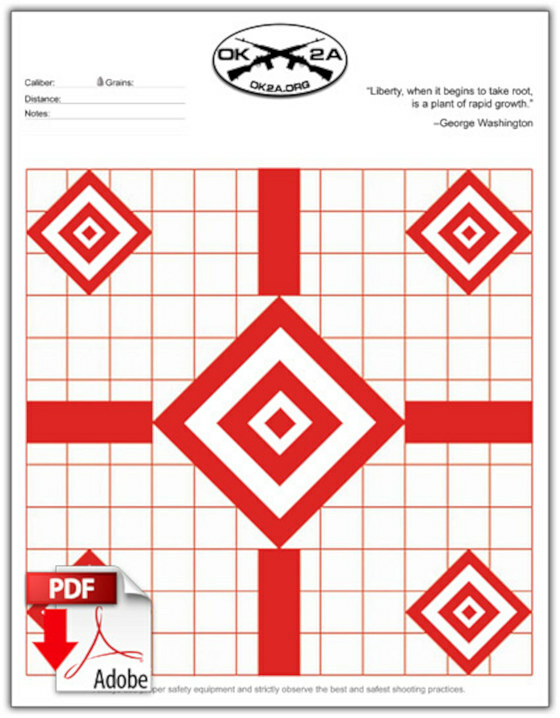 The unique, heavy-weight gift wrap features Dennis DeMille’s High Power Rifle National Record Target score of 200-20x+100-8x at 200 yards. The 36″ x 24″ sheets are made from 60# stock with a gloss finish. Individual bullseye wrapping sheets cost $1.95 or you can buy five sheets for $7.95 (and save 18%). This unique bullseye wrapping paper is perfect for presents you give to the shooters in your family. Bullseye wrap is also great for gifts a club may present to members/officers at year’s end. 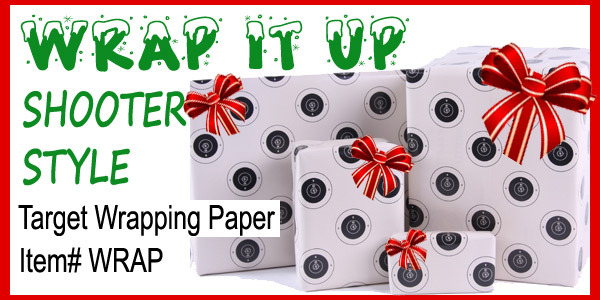 Share the post "Target Wrapping Paper for Holiday Gift-Giving"